Mangaluru, Feb 09, 2019: Mahamastakabhisheka Mahotsava at Dharmasthala is all set to thrill visitors and devotees, focusing on 39-ft tall Bahubali atop Rathnagiri from February 9 to 18. Arrangements have been made for smooth conduct of the Mahamastakabhisheka. 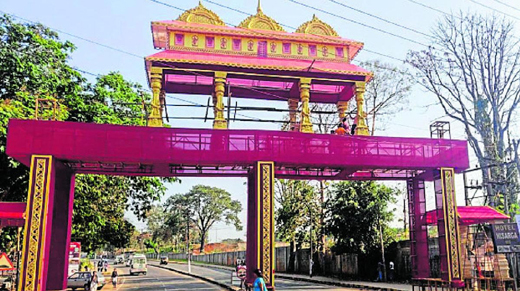 Huge temporary arches with decorations galore are erected on the stretch from Ujire to Dharmasthala with life messages of Bahubali. Welcome arches like Sri Janardhana Swamy Dwara at Ujire, Trinethra Dwara at Nethravathi Snanaghatta at Dharmasthala, Brahmi Dwara at Shantivana, Yaksha Dwara at Kalleri, Amaravathi Dwara at Periyashanthi are set to attract. Six Gopuras have been installed on the road leading to Rathnagiri with messages of Bahubali. A separate ‘Annachatra’ (Food complex) has also been built to serve meals to the devotees taking part in the Mahamastakabhisheka. 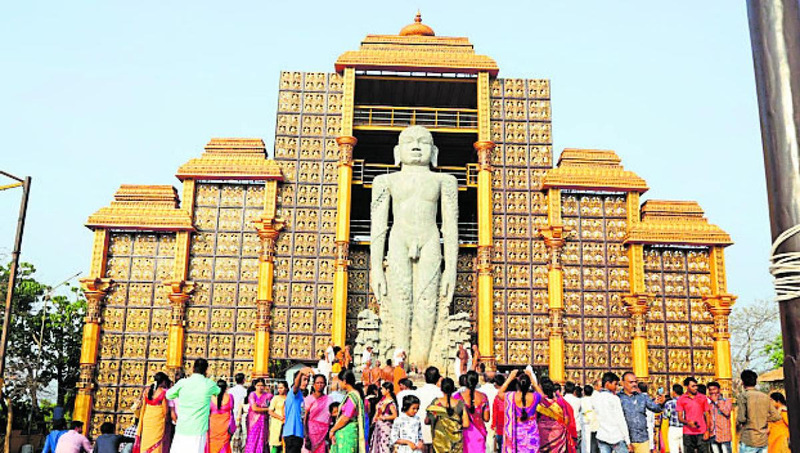 A ‘Yajna Mantapa’ with thatched roof has been constructed near the Bahubali statue. It is 70-ft tall and 29-ft wide and covers 2,030 sqft of plinth area. On February 9, ‘Agrodaka’ procession from Sri Chandranathaswamy Basadi to Rathnagiri Betta (hillock) will be held and ‘Indra Prathishte’ will be initiated. Later, “Thorana Muhurtha” will be held, after which ‘Mrithaka Sangraha,’ ‘Ankurarpana Vidhana’ and ‘Mahamangalarathi’ will be held at the Yajna mantapa. Mahamastakabhisheka with 1008 Kalash for the Bahubali will be held on February 16, 17, 18. A laser show at Rathnagiri will be inaugurated by actor Ramesh Aravind on February 9 at 7 pm. The laser show will highlight the story of Bahubali in the evening daily. ‘Kshullak Deeksha’ will be initiated to Sathish Ji Bayyaji, Pooran Bayyaji and Sriprabhu Bayyaji by 108 Pushpadanta Sagara Munimaharaja at Amritavarshini Hall in Dharmasthala on February 10 between 8 am and 10 am. A host of books will be released during the Mahamastakabhisheka. They are Veerappa Moily’s ‘Bahubali Ahimsa Digvijayam,’ S S Ukkali’s ‘Aadipurana Grantha,’ ‘Dharmasthalada Sri Gomateshwara Charithre’ and ‘Suvarnasanchaya’ on Golden Jubilee of Pattabhisheka of Veerendra Heggade will be released on February 14. Generally it is set to meet the high expectations of the public.